The new Sensational Sixes video slot is a charming addition to gaming libraries at Rival casinos. Players looking for something more visually entertaining or perhaps more sophisticated will indeed appreciate the 1930s elegance, while the golden frame strongly resembles the summer blockbuster, The Great Gatsby offering a mix of new Hollywood edge merging with old Hollywood grandeur. The gray and white chevron art deco design in the background provides the high-detailed golden frames and era-themed symbols all the glam they deserve. Apart from enjoying swing dancing to upbeat jazz music, gambling was amazingly popular, and Rival Gaming takes online players back to the razzle-dazzle entertainment of the era. 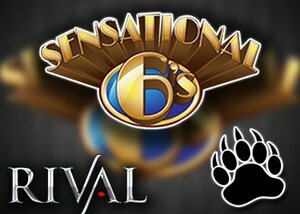 Sensational 6's slot features three reels, a single payline and an array of winning opportunities. By combining three golden bars, black clubs, red hearts, blue diamonds, or green clovers, high cash prizes can be claimed. The primary rewards are offered via the multiplier symbols and winnings worth up to 3,000 coins can be reached within a single spin. The 2x symbol appears exclusively on the first reel, the 4Xx on the second reel and the 6x symbol appear only on the third reel, while a perfect line -up of all three will reward the jackpot prize. Rival Gaming adds new releases on a monthly basis , and the new Sensational Sixes slot is the talented developers July 2017 release. Previous releases for this year include the three-reel classic Midas Touch, offering players the opportunity to enjoy a lavish feast in the presence of King Midas. A visit to Rome is possible via the May release, and by playing Chariots Of Fire players engage into a battle with Roman legionnaires. The Rival powered Ten Suns video slot launched in March, and 25 paylines tells the reel tale of the divine archer that saved earth from the heat of ten suns. In catering for all the different tastes of its online fans, the year kicked off with the sweetest rewards in Dollar To Donuts, a three-reel slot offering five paylines and Alien Spinvasion offered humanity the chance to win big across 50 paylines. Rival Gaming created well over 160 unique slots and casino games since its launch in 2005, and its i-slots collection is remarkably popular and allows online players to reach new highs in winnings via outstanding story-based play. The casino gaming selection created by Rival include three reel, five reel, progressive and i-slots, as well as table games, mobile games, and several specialty games. Rival fans now get the opportunity to dress up in double-breasted overcoats or sporting fedoras as Sensational Sixes is all about the glamorous 1930's. Slots Million Casino is our casino of choice when wanting to play casino games powered by Rival Gaming. This casino is filled with excitement around every corner, and welcomes its newest players with a generous welcome package valued at up to $1000. Register today and experience the value that Slots Million Casino brings to the table. We are pretty sure you will be glad you did!